Disc 1 - An Unearthly Child Pilot Episode - 25 mins Episode 1: Commentary with Verity Lambert, Carole Ann Ford, William Russell, Gary Russell Episode 4: Commentary with Waris Hussein, Ann Ford, William Russell, Gary Russell. Disc 3 - The Edge of Destruction Episodes The Edge of Destruction - 2 x 25 mins. Episode 2 - Arabic Soundtrack Extras Origins (dur. 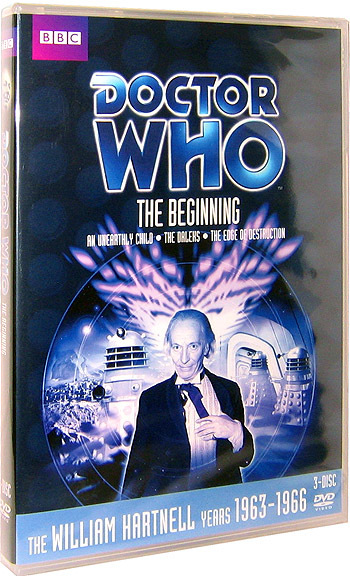 53') - an in-depth look at the creation of Doctor Who, including rare interviews with the programme's creator, the late Sidney Newman, and new interviews with other members of the cast and production team. Over the Edge (dur. 30') - a new featurette exploring 'The Edge of Destruction', featuring interviews with cast and crew.